We've currently got our top man out attending the Intel Developer Forum Fall 2008 in San Francisco in America and he'll be bringing us all the latest and most breaking news straight to the front page of bit-tech.net. If you're a bit strapped for time however, or if you just don't want to wade through all the other great content we have on the site, then this is a handy breakdown of all the latest tech news from the Fall 2008 Intel Developer Forum. The older stories are lower down on the page, so if you just want to stay briefed on the latest headlines then you only need to glance at the top half of the page. The highlighted stories are the ones we reckon are of extra special interest to our readers. All links will open in a new window, so if you want to pass on your thoughts then direct them all to the forums. Enjoy! Justin Rattner worryingly believes that machines have the potential to become more intelligent than humans by 2050. Intel is still banging the MID drum, but it's not good news when demos are unconvincing and devices are uninspired. Craig Barrett reckons that WiMAX will reach 50 million by the end of the year and a billion people by 2012. Intel has quietly announced the first dual-core Atom processor at IDF. It comes complete with a new motherboard that's almost the same as the last one. With the announcement of Visual Adrenaline, Intel will offer comprehensive support for game developers. John Carmack spoke about multi-threading support in the new id Tech 5 engine during Renee James' software keynote at IDF. One of the coolest things shown off at IDF was the fruit of a partnership between Dreamworks and Intel. After playing with many of the Nehalem machines dotted around IDF, it looks like the fastest Intel Core i7 processor at launch will be clocked at 3.2GHz. Anand Chandrasekher said that Moorestown is on track for 2009/2010 and shows off silicon for the first time. Yahoo! is working with Intel to deliver an Internet experience on Intel's CE 3100 media processor. Eric Kim announces Intel's first Consumer Electronics focused system on a chip during his Digital Home keynote. Intel announces small form factor Montevina/Penryn chips... looks like we'll be seeing an updated Macbook Air soon. 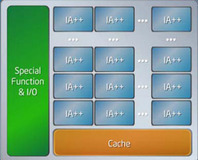 Dadi Perlmutter announces imminent availability of mobile quad-core processors based on the Penryn architecture. Intel sees the next evolution of the Internet as one that's embedded. 15 billion connected devices by 2015, reckons Pat. You've read all the details on Intel's upcoming SSDs; now we've taken a pre-production X18-M 80GB SSD apart for you. We've got the skinnies on the various Nehalem derivatives that'll be released over the next six-or-so months. Intel has revealed that the first SSDs will be available very soon, with more to follow in the first quarter of 2009. Intel Chairman Craig Barrett used this morning's opening keynote to deliver some strong political messages to the western world. Intel talks about its research efforts behind a new Connected Visual Computing initiative. DDR3 at 800MHz or 1,066MHz with the option for a 1,333MHz OC, but CAS latencies are currently through the roof. Nvidia recently held its annual Analyst's Day and, following some comments from Intel at the recent IDF in Shanghai, proceedings were a little unconventional. Nvidia CEO, Jen-Hsun Huang, took the gloves off and went for the jugular - read onto see his vision of the future.